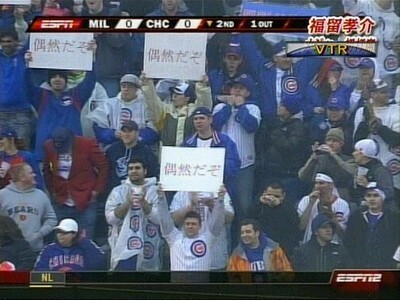 At a recent baseball game between Chicago Cubs & Milwaukee Brewers, fans of Cub's Kosuke Fukudome (福留 孝介) decided to make some signs to show their support for the Japanese player. However the phrase they wanted was mistranslated by machine translator seen here. The resulting 偶然だぞ is not flattering at all and is actually rather insulting, implying that Fukudome’s successes were merely a result of pure chance and not talent at all.